In a fascinating light, the Hoopa Trading Post Community Market is moving nearer completion with its construction. 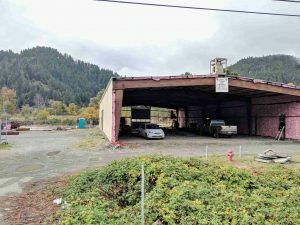 To be clear, both the upcoming Hoopa Trading Post Community Market (pictured below) AND Hoopa Grocery Store are on schedule to open soon. Concerning the Community Market, the construction team is aiming to begin offering a small supplemental market before the end of November 2018. We will release more details to the public on how to participate in the supplemental market sometime soon. To briefly recap, the Hoopa Trading Post Community Market strives to allow people a place to sell items to the community. The overall, long-term goal is to create more things locally and encourage more money in the local and surrounding economies. Additionally, the construction team will install a commercial kitchen for educational and canning purposes, among other applications. We excitingly look forward to the Hoopa Trading Post Community Market’s completion. As news on this building develops, we will circulate it out through the necessary local Tribal news mediums.